In fact, China is countering Indian influence in South Asia, as New Delhi has planned to establish its hegemony in the region. In this regard, the fast-growing economic power of China coupled with her rising strategic relationship with the Third World has irked the eyes of Americans, Israelis, some Western countries and particularly, Indians. Owing to jealousy, America desires to make India a major power to counterbalance China in Asia. America which is backing Indian hegemony in Asia, especially to counterbalance China is supplying New Delhi latest weapons, arms, and aircraft. During President Barack Obama’s second visit to India, the US and India announced a breakthrough on a pact which would allow American companies to supply New Delhi with civilian nuclear technology, as agreed upon in 2008. Besides, America also announced $4 billion of new initiatives aimed at boosting trade and investment ties as well as jobs for the Indians. During Indian Prime Minister Narendra Modi’s visit to America, the then President Barack Obama strongly assured him to favour India’s membership in the Nuclear Supplier Group (NSG), Earlier; Washington also pressurized the International Atomic Agency (IAEA) to sign an accord of specific safeguards with New Delhi. America had already contacted the NSG to grant a waiver to India for starting civil nuclear trade on a larger scale. In the recent past, during the meeting in Washington, the US President Donald Trump also gave the same assurances to Modi. By availing the US secret diplomacy, in the pretext of the presumed threat of China, India has been trying to establish her dominance in South Asia. Historically, India has continued interventionist and hegemonic policies vis-à-vis her neighbours through its secret agency RAW. Besides supporting separatism in East Pakistan which resulted in the dismemberment of Pakistan and continued assistance to the separatist elements of Pakistan’s Balochistan province, New Delhi occupied Sikkim, subdued Bhutan, sponsored terrorism in Sri Lanka, and has been teasing Nepal. As part of the double game, India has also been making a cordial relationship with the small countries of South Asia with a view to colonializing them gradually. For example, during the visit of Prime Minister Sheikh Hasina to New Delhi, India and Bangladesh on April 8, 2017, signed 22 agreements in the fields of defence cooperation, civil nuclear energy, space and cyber security among others, following bilateral talks between Indian Prime Minister Modi and his Bangladeshi counterpart. Both the countries also signed a Memorandum of Understanding (MoU) through which India would extend a line of credit of $500 million to support Bangladesh’s defence-related procurements. India is planning to counteract China’s influence in Sri Lanka. In this respect, two different stories in published in Indian media, need attention. Similarly, Indian media and websites gave much coverage to an article, published by German TV Channel (Which also publishes online news items) under the title “India Nips at China’s Heels in Race to Collect Lanka Port Assets” written by Iain Marlow and Saket Sundria, April 26, 2017. Iain Marlow and Saket Sundria further wrote, “Beijing has also invested heavily in Gwadar, a port in Pakistan that serves as the terminus of the China-Pakistan Economic Corridor. Nevertheless, India’s endeavour to alienate Nepal from China will not succeed, as a majority of the Nepalese is aware of this duplicity of New Delhi. Besides, as part of the double game, based in Afghanistan, CIA-led Indian RAW and Israeli Mossad are also destabilizing Afghanistan and Pakistan through terrorism-related attacks and are giving a greater setback to the collective efforts of Russia, China and Pakistan which want peace and stability in Afghanistan. Nonetheless, China is successfully countering Indian influence in South Asia. New Delhi will have to understand that maintaining hegemony in the region through negative planning is a bad idea in the 21St century. If India has to create a positive role, she will have to lend a hand to its Chinese investment in Bangladesh and other South Asian countries. Recently, quite a few stories have appeared on the China-Pakistan Economic Corridor (CPEC) in both local and international publications. A lot of traction was gained by the cynics of CPEC by reporting factually incorrect information. Consequently, myth spurring on CPEC is on the rise. I am going to take this opportunity to debunk these myths by stating the facts. A pointless controversy was created on the Long Term Plan (LTP) by a recent article featured in a local English-language newspaper. The report published as ‘LTP’ in that article was an initial draft by the China Development Bank (CDB) and not a part of the agreed LTP. That article basically cherry-picked information from different sources to present a distorted picture of the LTP. The fact is that the government of Pakistan has prepared its own plan after multiple stages of consultation with provinces, federal ministries and their respective technical groups. The LTP has been prepared to develop Pakistan in line with the seven pillars of Vision 2025 which are predicated on the notion of inclusive and sustainable development. The main pillars of LTP are connectivity, energy, industries and industrial parks, agricultural development and poverty alleviation, tourism, cooperation in areas concerning people’s livelihood and financial cooperation. It was shared with the Chinese authorities following approval by the cabinet. The Chinese side has given its approval in principle, however, its formal approval is expected by the end of this month, as our Chinese counterparts were occupied by the Belt Road Forum. As soon as we get the official approval from the Chinese side, we will put the LTP on the CPEC website. One of the biggest myths propagated on CPEC is that Pakistan might become a colony/province of China. Any historian would tell you that colonialism and imperialism are legacies of countries of the global north. China has never invaded any country nor harboured any imperial designs. Cynics point out towards rising trade deficit with China as a reason to show concern on CPEC. The reality is that China’s competitiveness in exports is universal and not idiosyncratic to Pakistan. Pakistan’s current trade deficit with China is $6.2 billion. In comparison, India’s trade deficit with China stands at $47 billion. The US trade deficit with China is $347 billion. Based on these trade deficit numbers, is it appropriate to infer that the US or India are becoming colonies/provinces of China? Certainly not. Similarly, it is ludicrous to make such claims about the Pakistan-China relationship. Both countries respect the sovereignty of each other and CPEC is based on the shared vision of both countries: Vision 2025 and OBOR. At present, only a few thousand Chinese nationals are living in Pakistan and making a positive contribution towards our economy, the majority of them fall in the category of temporary labour migrants who will return back upon completion of the projects. In contrast, around 8 million Chinese are living in Malaysia, 400,000 in France; 600,000 in Japan; 900,000 in Canada and over 2.5 million are living in the US. Therefore, to say that Chinese are overtaking Pakistani society is nothing but a farce. Chinese nationals working in Pakistan are our national guests as they are helping us to build a developed Pakistan. Another myth spread on CPEC is that China is dictating terms to Pakistan and the federal government is not consulting the provinces. The reality is quite the opposite. China and Pakistan work jointly in making an overall planning for a unified development of CPEC projects. In this regard, the Long Term Plan, Transport Monographic Study and respective MoUs guide the policy for CPEC. All provinces have been consulted and invited to all meetings within Pakistan and abroad for their recommendations and review of CPEC projects. Earlier this month, the chief ministers of all four provinces under the leadership of PM Sharif attended OBOR Summit in China. On 29th December 2016, all CMs participated in the 6th JCC meeting which was held in Beijing. For institutional arrangement and development of CPEC, the National Development and Reform Commission (NDRC) of China along with the Planning, Development & Reform Ministry of Pakistan have constituted subsidiary working groups of the Joint Cooperation Committee (JCC) on planning, transport infrastructure, energy, Gwadar and industry cooperation. Since the signing of the MoU in July 2013, six meetings of the JCC have been held. The highest officials of every provincial government are represented in JCC meetings. It is impossible to hide or misrepresent any information on CPEC from provinces. Information on ongoing and agreed CPEC projects is available on the official website of CPEC. Moreover, the planning ministry is always available to address any queries regarding CPEC. All the Chinese companies involved in CPEC projects are nominated by their government. Therefore, there is no question of favouritism on the part of the government of Pakistan. Another myth propagated around is that Pakistan is not going to gain any economic benefits from CPEC and it is tantamount to the 2006 Free Trade agreement (FTA) with China. First of all, let me explain that an FTA works out on the basis of demand and supply of market forces. China enjoys a competitive edge in exports vis-à-vis all other economies of the world, including Pakistan, whereas CPEC is qualitatively different from an FTA. It provides necessary stimulus to kickstart the processes of industrialisation in Pakistan. Without sufficient electricity and adequate infrastructure, it is not possible to carry out industrialisation. CPEC brings $35 billion investments in energy projects. Alongside coal, clean and renewable energy projects are part of the CPEC energy portfolio. The existing energy policy was made before the CPEC MoU was signed between China and Pakistan. Prior to CPEC, nobody was interested in making investments in our energy sector. At that crucial time, China took a lead and demonstrated to the world that Pakistan is a reliable and secure destination for foreign investments. Energy investments under CPEC will remove a major bottleneck that is in the way of realising high economic growth. It will reinforce the main grid structure, power transmission, distribution network, and improve power supply. Currently, 14 energy projects are in the implementation stage. Through CPEC projects, 10,000MW of electricity will be added to the national grid. Only 16,000MW was added to the national grid from 1947 to 2013. Moreover, energy projects under CPEC are not funded by Chinese loans instead they are undertaken in the IPP mode regulated as per NEPRA tariffs. Average cost of these projects is lower than the current cost of production of energy. 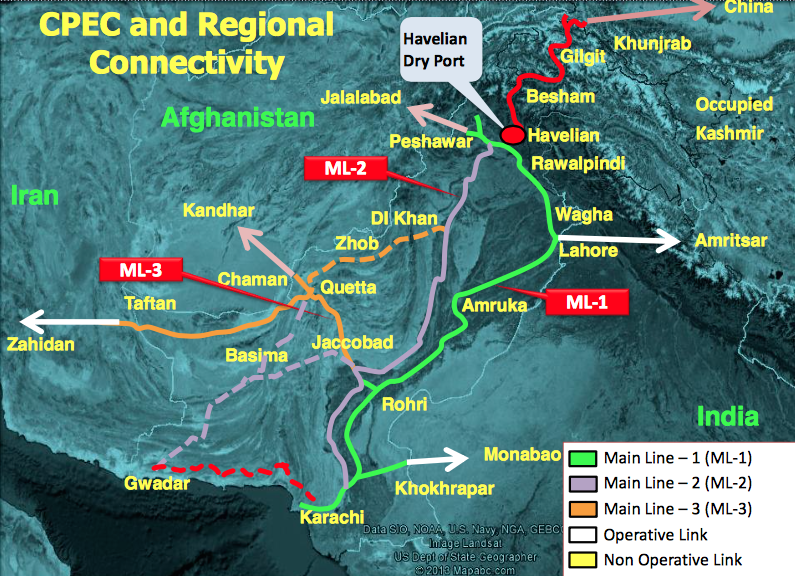 Under CPEC, new road and rail networks are to be built in all four provinces to enhance and improve connectivity within Pakistan. In addition to economic benefits of connectivity, social and regional cohesion will increase within Pakistan and in the region. Once energy and infrastructure bottlenecks are addressed, it is estimated that GDP will at least increase by more than 2 per cent from its current trend. Similarly, one of the important components of the CPEC framework is industrial cooperation. Nine industrial zones were included in it with equal representation of all provinces. The cost of production is steadily increasing for many industries in China due to increase in wages. It is estimated that 85 million jobs will be relocated and countries in the Far East, Asia and Africa are competing for these jobs. Pakistan wants to secure a big share of the relocation of these industries and jobs. Once relocated, this will create a huge demand for labour in Pakistan and enormous employment opportunities will be available for Pakistanis. In the current projects of CPEC, two thirds of the workforce is Pakistani and only a critical mass of labour force comes from China. This is a great opportunity for the Pakistani workforce to learn and update their skills from their Chinese counterparts. Already a boom in steel, cement and construction industries has created multiplier effects in the overall economy. Economic benefits of CPEC are net positive for Pakistan. CPEC is a golden opportunity for Pakistan to undo the mistakes of the past and we, as a nation, cannot afford to be complacent about it. Published in The Express Tribune, May 25th, 2017. First, we should develop a dynamic, innovation-driven growth model. The fundamental issue plaguing the global economy is the lack of driving force for growth. Innovation is the primary force guiding development. Unlike the previous industrial revolutions, the fourth industrial revolution is unfolding at an exponential rather than linear pace. We need to relentlessly pursue innovation. Only with the courage to innovate and reform can we remove bottlenecks blocking global growth and development. Fourth, we should develop a balanced, equitable and inclusive development model. As the Chinese saying goes, “A just cause should be pursued for common good.” Development is ultimately for the people. To achieve more balanced development and ensure that the people have equal access to opportunities and share in the benefits of development, it is crucial to have a sound development philosophy and model and make development equitable, effective and balanced.